Only a few ingredients are needed to make beer. In fact, the German beer purity law requires that beer only be made from water, hops, barley (malt), and yeast. Most beer recipes follow this basic outline, but other ingredients have found their way into the mix as breweries are continually experimenting with ingredients – pumpkin or cucumber beer, anyone? Adjunct brewing is also common practice, substituting malt with ingredients like corn or rice, which provide starch for fermentation. 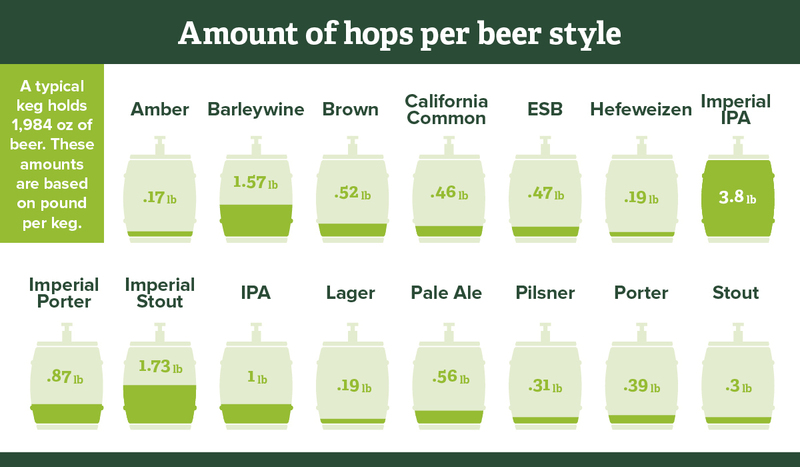 For a long time, lighter pilsner and lager beers were the most prominent style. These mostly utilized high alpha hops for bittering to balance out the sweetness levels. A few finishing hops were added at the end of the brewing process for aroma. With the growing popularity of hop aromas, as experienced in an IPA for example, more breweries are using larger amounts of aroma hops and adding them in more stages throughout the brewing cycle. Techniques such as dry hopping – fermenting beer with hops in it – add aroma without the extra bitterness. Wet hopping is also increasing in popularity, yet not as common due to the difficult logistics. This technique (brewing with fresh, un-dried hops within 24 hours of being harvested from the vine) also results in imparting vivid aroma and flavor profiles with decreased bitterness. 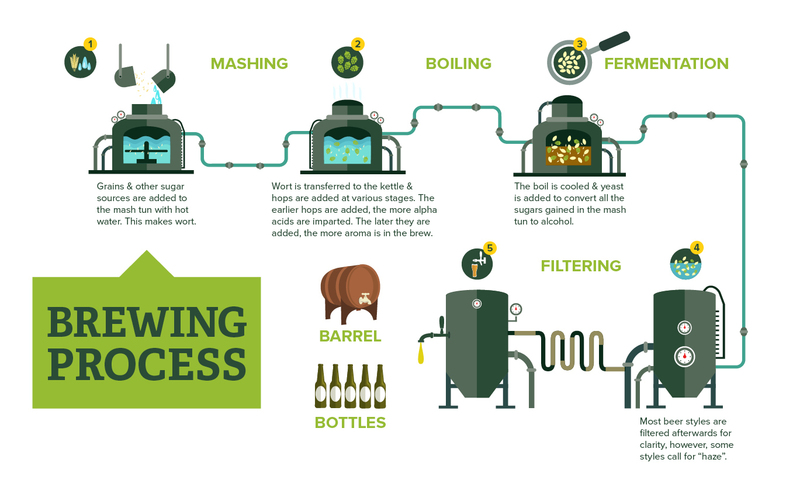 To start the brewing process, barley malt is ground, boiled, and mixed with other grains and sugar sources if desired. This is referred to as mash. Grinding the grain exposes the starch and, when boiled, the starch is converted to fermentable sugar which yeast consumes and converts to alcohol. Now the mash is separated, and the leftover grain (known as spent grain) is diverted and often repurposed, being sold as livestock feed. The clear liquid that remains is known as wort and contains the sugars that will be fermented. The wort and hops are boiled in the brew kettle to extract the hop resins and oils. Bittering or dual-purpose hops are added early in the process to impart bitterness, as they release more alpha acids the longer they boil. Hops are then added throughout the boil at different segments, saving the aroma (finishing) hops for use toward the end. The later they are added in the process, the more their aromatics are emphasized and the less bitterness they impart. The beer is cooled, yeast is added, and then it ferments. Times vary widely depending on style. Not sure you’ve got it quite yet? Try checking out other resources online.